Seriously, the thing I found most surprising about the NYTIMESMAG piece was how many times Wall mentioned Winogrand. (Two of four, total.) In hindsight, the connection’s clear – Wall’s as precise as Winogrand was intuitive, and Wall attempts to pack as much serendipitous docu-punch as he can into his premeditated fictions. I’m not going to get into the “staged photography feels canned” debate, but I want to examine the push & pull (or the balance) between photography that’s based in ideas, and photography that relies on the candid nature of what is already out there, in the world. 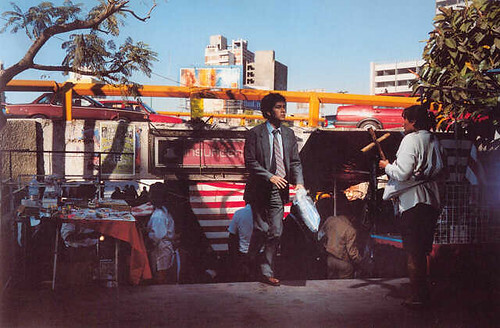 A few photographers, most notably Mr. Wall (and ofCourse diCorcia), have attempted to weld the mystery meat of street photography to the precise predictability of the studio, with the goal of illuminating, examining, and generally holding-up for inspection, executions on an idea. Wall claims the idea behind his photographs are their referential nature to the Grand History Of Painting, which creates a comfortable defensibility of whatever he chooses to put in front of his lens. It sounds a little easy, regardless of how complicated the shoots are, or how enveloping their presentation. As ideas, it’s a challenge to be swayed by a modern take on Hokusai when the original’s so good. And there’s always Breathless vs. Breathless. As photographs, Wall’s are as seductive as the museum’s exit door. They inspire me to want more real life, which is a difficult thing for any kind of art to achieve. The more I look at a Wall, the more I want to be outside, away from photos in lightboxes, experiencing new things. 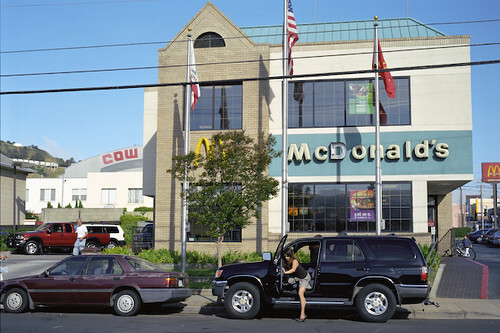 diCorcia’s an altogether different animal. “Heads” is successful in that he harnessed the unharnessable in a thoroughly contemporary presentation; big prints, crisply clear, in color. 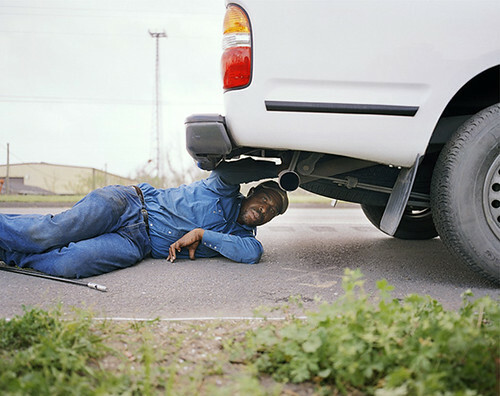 His other street work, while similarly spectacular, makes me wish I never knew how staged they were, so I could enjoy them for what they are – fantastic photographs made to look like reality. I might sacrifice all that large-format and well-lit clarity for a little bit more verite, but in doing so, I’d be wishing diCorcia were an altogether different photographer. Which brings this; what does a mash-up between premeditated conceptual photography and go-as-you-flow street photography sound like? Is successful conceptual street photography even possible? Cerebral marries Intuitive and they have a kid that looks like what? Examples might be location based. There’s Ruscha’s photographs of the Strip (more concept than street), Beat Streuli‘s street work (more street than concept – though his site used to have a selection of candid portraits from one particular location), the peopled frames from Ulrich’s “Copia“, Bruce Davidson’s Subway (more documentary than conceptual), and maybe even Harvey Keitel’s photo-project in that Wayne Wang film (“Smoke” or “Blue in the Face”?). I’m looking for examples that steer away from object-based cataloging, like “pictures of men in funny hats” or “pictures of sewer grates around the world”, or all the buildings on Sunset Strip, for that matter. On the hats front, Parr‘s hat photos from Mexico (and his Last Parking Space work) would probably count as examples, though they lean heavily to the conceptual side, as do Tim Davis’ unpeopled retail reflections. For my money, fellow blogger Amy Stein’s project “Stranded” is reaching for the gold ring. Hers is a kind of documentary (not street street) photography, as funneled through a tightly focused idea. As a project, Stein’s may be more conceptual than candid, but the idea behind the pictures informs each frame in a way that makes each glow brighter. Plus, the idea’s warmer than most, and the execution, both singly and in aggregate, is damn impressive. I like her series (and the idea behind them) so much they make me wince. Wow. Los Angeles-based photographer Raoul Gatepin is onto something with his photographs of planes from the streets around LAX. Raoul loves cops, apparently. While the pictures are all of a catalog-able object (planes as seen from the street), and they’re all about the moment, his pictures aren’t just flat documents of what is there; the best of them open-up into the world of interpretation. They’re unwieldy, in a good way. If, like Raoul’s planes, the project’s object-based, I’m hoping the pictures have the potential to be read and interpreted in multiple directions, and they gain strength in aggregation. On the self-link front, I did a project last year called Palace Cow, which probably softpedals a small idea in the aggregate, and it’s nothing without signage. To confuse the issue, isn’t all photography idea-based, to varying degrees, even if it’s “my idea was to take the picture”? Help a blogger out and leave examples (of conceptual street photography) in the comments. Many thanks for that, and for making it all the way to the end. Great post. For me – my own personal response – photography derives 95% of its punch from that sweet spot where the artist’s authorial intent meets the wanderer’s serendipitous discovery. For me it loses that punch if it’s too concept-driven to allow chance to come into play, and heavily. I had the exact same reaction to DiCorcia. As for examples, I’m immediately thinking of some of the more “street” work of Sternfeld, Shore, Espstein, etc. Would you consider work like Epstein’s “Recreation” or Owens “Suburbia” in this category, or are they too documentary? I might suggest books like Susan Lipper’s TRIP. Parke’s Minutes to Midnight is a possibliltiy also. In both, the connecting narrative/idea appears to have come AFTER the pictures were made. Does that count? I dislike staged, conceptual photography. Unless it’s done by someone really really good. Actually I also dislike purely candid photography. Um, unless it’s done by someone really really good. I can name lots of photographers whose work I just adore, and lots of famous ones I can’t stand, but they fall all over the philosophical spectrum. Just when Jeff Wall’s MOMA show makes me hate staged photos I remember how Loretta Lux’s prints in Chelsea last fall just blew me away. I can stare at a huge Crewdson print all day long. I’m finding it hard to state a dislike for any particular concept or philosophy because as soon as I do someone comes along down that alley and knocks my socks off. In fact one or two of those Jeff Walls were just wonderful. Ooh, forgot about Epstein’s “Recreation”, though all of this becomes a slippery slope the more journalistic (think Webb) or conceptual (unstaged Shore?) it gets. I thought about including Minutes to Midnight, but I’m not entirely clear about what the concept is behind the color street work. I get the understory with Parke’s black-and-whites, but the concept with the rest is unclear – to my eyes. They’re incredible, though. Maybe I should see if he wants to chat so we can find out. Sternfeld should definitely be included, for American Prospects, and maybe even Highline, however unpeopled. It’s amazing how his large-format frames have the streety, improvisatory feel of a small camera, with all the big camera detail. Not the portraits – I’m thinking of the Space Shuttle picture, the Hoover Dam Baby, the Atlanta workers, even that Pumpkin Fire. With a camera like that, you can’t stumble into the right place at the right time, which makes his accomplishments that much more unbelievable. Shore’s a sticky widget. He’s harder to boxify, to his credit. I am surprised you haven’t mentioned Stephen Gill’s work. Matt – Just found Stephen Gill tonight, seconds before your post! That “Invisible” book of his surely fits the bill — though it’s not too far removed from a collection of men with funny hats. I haven’t been able to come up with any who get at exactly the marriage of candid (bystanding) and conceptual (standing by?) you’re talking about. But it’s fun to try. Ray Metzker didn’t overlay a conceptual veneer on the streets of Chicago and Philadelphia as much as he distilled (2), abstracted, and multiplied (2) them. It’s more an expression of style, but it can also be considered idea-based. I will say that I think the existence of Atget and Evans made the conceptualization of the street possible. I might sound like a broken record, but Tim Davis’ My Life in Politics has some really great work that would fit into this category. Really interesting post, and it strikes a chord with me as im constantly battling with myself over the conceptual side of street photography. What i mean is, my photography at the moment, to me, just represents a bunch of singles. Street photos, with no concept, theme, or idea behind them, just a bunch of random compositions. Im constantly thinking about concepts, ideas, that i can then go out and explore with my camera, but im always failing in coming up with any answers to my own questions. Its driving me nuts! But through it all i know i must not stop shooting, because just by doing so, something could develop without me consciously knowing it. Hey wait, Bill Sullivan’s work definitely fits the bill. Perfect combo of what Andrew mentioned; “bystanding” & “standing by”. Should have included it in the post itself. Sorry Bill! I thought Wall’s most effective work at the MOMA show was his more claustraphobic interiors like “A ventriloquist at a birthday party in October 1947”. His “street” work may have be conceptual but their craftiness seemed to exceed their imaginativeness. aLong comes through with this season’s harvest of links. Thanks, Andrew. I’d forgotten about Metzker, and yes all these links fit, I think. Matt, I haven’t gotten around to Klein (or the Japanese, who are linked in my mind, somehow) because a) their books are too expensive or b) I just haven’t gotten around to them or c) I don’t understand their stylization or d) a combo of any or all of the above. I like Klein a lot, and have spent hours here and there with his work in libraries, but haven’t had real time to think about it and write-up anything… Soon? There’s also a distinction to be made between staged and street photos that aren’t completely candid. For a while, working in Tokyo, to get access to certain areas of Kabukicho after midnight, I had to bribe some of the bouncers and gangsters with portraits, followed later with prints. At the time, I considered these throwaways, the cost of doing business, but some of them surprised meâ€”they had merit, artistically. Other times, I’d take a shot after asking. I’d ask to take a shot, then do a few after they thought I was done. Sometimes these worked out well, better than you’d expect. I don’t consider these “street” really, but I’m not limiting myself to that. They’re people in the places where I shoot, doing what they do. They just happen to know I’m taking their photo and don’t pay much attention. I’ve never staged a street shot, though. I’m not opposed to it in principle, but I can’t see how I could make it work, at least in the sort of shots I take now. Could be an interesting challenge. As always, an interesting read, Michael. Thanks. This is a very interesting article, it made me think about my fundamental aproach to photography. I hope you enjoy flickr’s splitsecond group, you are more than welcome!